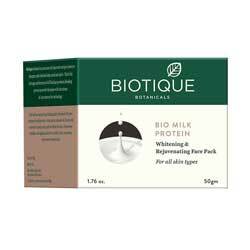 Biotique Bio Milk Protein Whitening, Rejuvenating, Hydrating Face Pack eases Wrinkle and Smoothes Skin, Moisturize, Revitalize & Lightens Skin. Biotique Face Pack - Worldwide Shipping. Moisturize and revitalize skin. Eases away wrinkles and lightens skin. This whitening and nourishing pack is blended with pure extracts of milk protein, wheat germ, almond oil, honey and seaweed to moisturize and revitalize the skin. Eases away wrinkles and lightens skin for a visibly fairer, smoother, rejuvenated complexion. Apply evenly over cleansed face, neck and around eyes. Leave on for 15-20 minutes. Rinse with water or damp washcloth. Use daily or as needed.